Fixes rips and holes fast. Permanent, flexible, waterproof repairs to natural and man-made fabrice, Nylon, neoprene, rubber, leather, PVC, PU and most plastics. 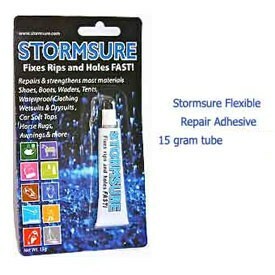 Ideal for repairing rips, splits, leaks and tears in waders, leather boots, shoes, wellington boots, wellies and waterproof clothing, tents, marquees, ground sheets, awnings, paddling pools, pool liners, inflatable boats and toys, horse rugs, trainers, car soft top repair, childrens toys etc. Works on most materials, but not Polythen, Polypropylene or PTFE . The only glue you need to fix a rip leak or tear on any flexible material or fabric. Very strong, but remains flexible when cured. Very resistant to abrasion. Essential in a repair kit for campers, caravaners, fishermen, SCUBA divers, wind, kite and board surfers, sailors, soldiers etc. Looking to buy some Fishing Waders as part of a fishing gift? If you would like some advice on purchasing Fishing Waders, simply contact our expert fishing team, giving us either an email or phone number on which to contact you and we'll get back to you right away with the best advice and prices. FREE Delivery on all Leeda Fishing Waders over £100!! !